I procrastinate. A lot. When it comes to getting things done, I need all the help I can get, so when I heard about Things for Mac OS X, I couldn’t wait to get my (virtual) hands on it and try it out for myself. 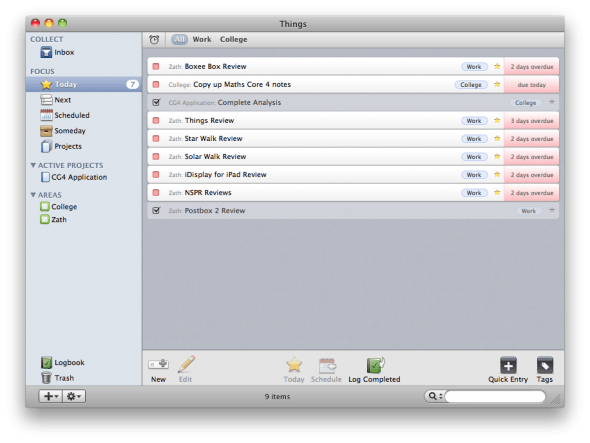 Things is a task management system that makes sure you always know what you’ve got coming up, whether it’s in the next day or the next year, and keeps you as productive as possible by alerting you when tasks are due. The concept of Things is fairly simple: you input any details of a task that you have to complete, either by using the main application window, or the system-wide quick entry window, give it a due date if it has one, and tag it with any additional information you deem necessary. You can even add links to files and email attachments that are relevant to your to-do. The main window of Things houses all of your to-dos in various sections depending on whether you have assigned an area or project to your task, and when it’s due, or scheduled. If you enter a quick to-do using the pop up window, it will be placed in the Inbox area of the application for sorting at a later date, unless you specify otherwise. Any tasks that are due today, or have been scheduled to be shown on today’s date will be in the “Focus” area, so you know exactly what you have to do, and when the task is due. If you’re an iCal user, you’ll be glad to know that all of your tasks can be synced with your calendar whenever you choose, depending on your selection in the preferences section. A lot of people who have iCal open all day will find this invaluable, as they can see all of their to-dos alongside the day’s schedule. Moreover, as if that wasn’t enough, you can also pair Things for Mac with the iPhone and iPad application, meaning that you can be checking of all of those to-dos of yours whilst your on the go. Could you be more organised?! With the ability to tag to-dos, and then see to-dos with only certain tags in them when browsing through the application, you can turn a long, daunting list of tasks in to more manageable chunks. I find myself utilising the “Areas” feature often, so that I can distinguish between tasks that I have to complete for Zath, any college work that needs doing, and personal to-dos that I need to take care of, too. Whenever you complete a task, it will be logged in the “completed” section of the application at the end of the day, or you can do this manually at any time you choose, so that you can refer back to it in the future. The only task that Things can’t do is complete your to-dos for you; you’re on your own for that, and although I’m getting better at task management myself, a few of my items are still going overdue by one or two days. There’s no doubt that Things has helped me to be much more organised, however, and I would recommend it to anyone looking to keep their task list under control. You can download a free trial of Things from the Cultured Code website, and if you like what you see, you can purchase it for £44.95.